Kosice has long been a hidden medieval gem. Kick off your visit on the 28th (Tue): make a trip to Súsošie Immaculata, then rejuvenate with a delicious beverage at Smelly Cat , CAFE & BAR, then contemplate in the serene atmosphere at Cathedral of St. Elizabeth (Dom svatej Alzbety), and finally admire the local landmark of Singing fountain. For reviews, other places to visit, and more tourist information, read our Kosice travel guide. June in Kosice sees daily highs of 28°C and lows of 15°C at night. Finish your sightseeing early on the 28th (Tue) so you can travel to Kosice. On the 29th (Wed), savor a hot drink at Smelly Cat , CAFE & BAR, then take in the spiritual surroundings of Cathedral of St. Elizabeth (Dom svatej Alzbety), and then ponder the design of Singing fountain. To find traveler tips, maps, photos, and tourist information, you can read our Kosice travel guide. Finish your sightseeing early on the 29th (Wed) to allow enough time to take a shuttle to Krakow. One of Poland's oldest cities, Krakow sits at the foot of the Carpathian Mountains, its historical town center nestled on the left bank of the Vistula River. On the 30th (Thu), contemplate the long history of Wawel Cathedral and then admire the landmark architecture of St. Mary's Basilica. To find ratings, photos, traveler tips, and tourist information, read our Krakow travel guide. Traveling by shuttle from Kosice to Krakow takes 3.5 hours. Alternatively, you can drive. In June, plan for daily highs up to 26°C, and evening lows to 13°C. On the 30th (Thu), wrap the sightseeing up by early afternoon so you can drive to Prague. 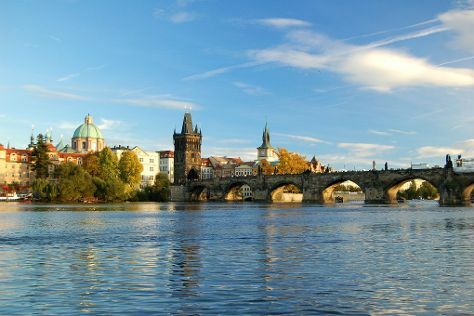 Prague lures millions of tourists each year with its World Heritage-listed medieval city center--a labyrinth of narrow lanes, bridges, cathedrals, and palaces overlooked by a thousand-year-old castle. Kick off your visit on the 1st (Fri): take in the views from Charles Bridge, contemplate the long history of Old Town Square, and then appreciate the extensive heritage of Prague Castle. To see ratings, reviews, photos, and other tourist information, read our Prague travel guide. Traveling by car from Krakow to Prague takes 6 hours. Alternatively, you can fly; or take a bus. In July, plan for daily highs up to 30°C, and evening lows to 18°C. Wrap up your sightseeing on the 1st (Fri) to allow time to drive to Dresden. Start off your visit on the 2nd (Sat): admire the striking features of Frauenkirche Dresden and then don't miss a visit to Procession of Princes. To find photos, reviews, traveler tips, and more tourist information, you can read our Dresden travel guide. Traveling by car from Prague to Dresden takes 2 hours. Alternatively, you can take a bus; or take a train. In July, plan for daily highs up to 28°C, and evening lows to 17°C. On the 2nd (Sat), wrap the sightseeing up by early afternoon so you can drive to Vienna. Kick off your visit on the 3rd (Sun): meet the residents at Schönbrunn Zoo and then admire the natural beauty at Schoenbrunn Palace. To see more things to do, reviews, maps, and other tourist information, you can read our Vienna travel guide. Traveling by car from Dresden to Vienna takes 6 hours. Alternatively, you can do a combination of flight and train; or take a bus. In July, daily temperatures in Vienna can reach 31°C, while at night they dip to 18°C. Wrap up your sightseeing on the 3rd (Sun) to allow time to drive to Bratislava. Slovakia's capital, Bratislava, attracts visitors for its natural beauty and rich culture, offering a plethora of landscapes, outdoor activities, historical monuments, and a stately old town. Start off your visit on the 4th (Mon): contemplate the long history of Old Town Hall, don't miss a visit to Hlavne Namestie, then pause for some photo ops at Napoleon’s Army Soldier Statue, then make a trip to St. Michael's Tower & Street, and finally contemplate the long history of St. Martin's Cathedral. To find other places to visit, maps, ratings, and more tourist information, you can read our Bratislava travel guide. Drive from Vienna to Bratislava in an hour. Alternatively, you can take a bus; or take a train. In July, plan for daily highs up to 32°C, and evening lows to 19°C. Finish up your sightseeing early on the 4th (Mon) so you can go by car to Budapest. You might consider the city of Budapest, divided by the Danube River into two distinctive cities--Buda and Pest--to be essentially one large World Heritage Site. Kick off your visit on the 5th (Tue): see the interesting displays at House of Terror, then get a sense of history and politics at Residence Parliament, then admire the striking features of Matthias Church, and finally steep yourself in history at Fisherman's Bastion. To see where to stay, traveler tips, other places to visit, and tourist information, use the Budapest travel guide. Getting from Bratislava to Budapest by car takes about 2.5 hours. Other options: take a train; or take a bus. In July, plan for daily highs up to 32°C, and evening lows to 18°C.